Is how top ski journalist Christopher Solomon described his stay at Bighorn in Revelstoke. The whole experience felt like a “dream”, with the thrill of heliskiing in the Monashee Mountains, accommodation in a “tricked-out timber framed manse”, rejuvenating spa treatments and cuisine to die for. “We dive, hooting and laughing in 18 inches of untouched snow. It’s not a bad warm-up. Soon we’re hammering to the next powder run. 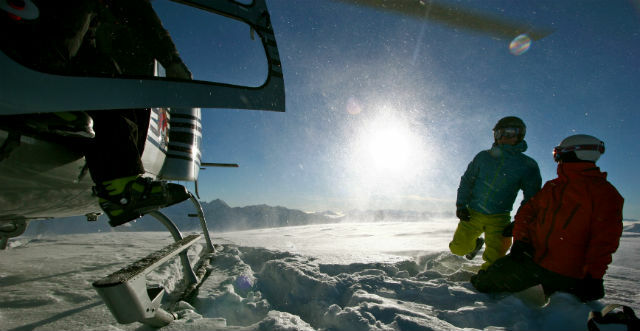 It’s only going to get better, and steeper, from here—and yet, weirdly, I’m already half-dreaming about après-ski back at the lodge… where chef Peter Hughes will be waiting in the rotor wash with a plate of salmon blinis, and then we’ll all marinate in the hot tub with a bucket of iced Mt. Begbie Kolsches within reach”. 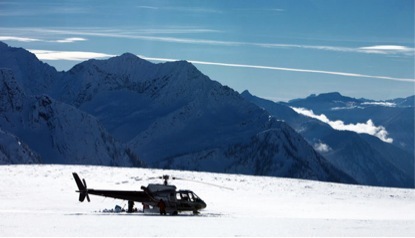 Click here to read the full article or visit our website http://www.bighornrevelstoke.com for more details on how to recreate this dream heliski trip. Bighorn Executive Chef Peter Hughes not only creates dishes to delight the taste buds but he also knows that at Bighorn food is fuel for a day heliskiing in Revelstoke’s powder bowls. In the latest installment of Notes from the Chef’s Table, we focus on the humble walnut. After reading in Mens Journal that walnuts pack more than double the amount of anti-oxidants than any other nut, Peter decided to do a little research. The micronutrients in walnuts can help with balance and co-ordination as well as boosting blood flow to help your muscles perform harder, longer and more efficiently. It sounded like the perfect skiers nut! 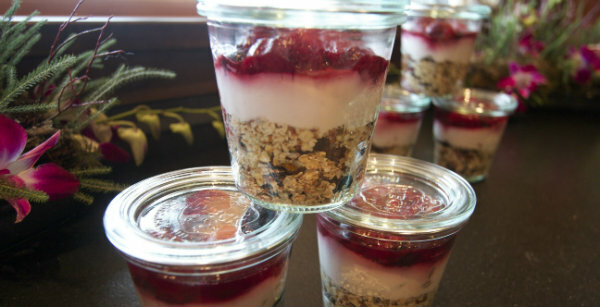 Blitz all ingredients together and store in the fridge for up to a month in an airtight container. 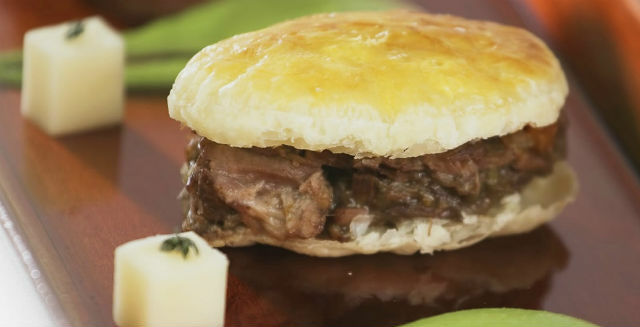 Delicious as an accompaniment to pasta, gnocchi, stirred into hot steamed broccoli or just as a sandwich spread. More top tips for foodie skiers will follow next week! It’s that time of year again – the shops are filled with pink balloons, expensive chocolates and teddy bears. Yes, Valentine’s Day is looming. The team at Bighorn know there is only one place to be in the middle of February however and that is on the slopes, as conditions in Revelstoke are amazing. With heaps of fresh snow and bluebird skies, guests have been hitting the high alpine and loving the powder, views and awesome terrain. 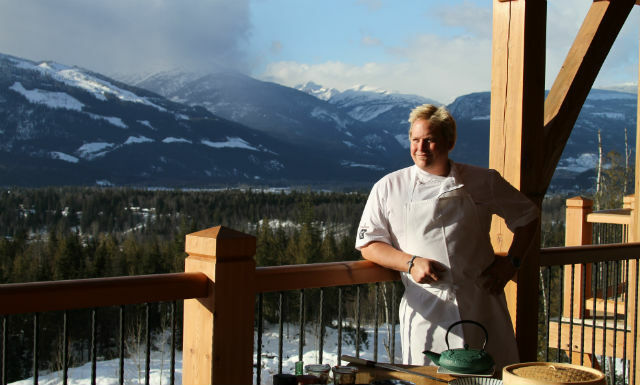 The Bighorn Chef, Peter Hughes, can create a special Valentine’s menu for any love birds who want the best of both worlds: amazing heliskiing and romantic gastronomy. We’ve got a sneak preview of what he is planning, it sounds delicious even if you’re not feeling romantic! Perfect fuel for another day skiing the dream. For anyone who is thinking about taking the plunge and asking the big question this Valentines’s Day, Bighorn can now arrange heli weddings! Take off from the property’s private helipad, take your vows on top of a peak, enjoy a love ski and then fly back to Bighorn for an unforgettable wedding banquet. Allow us to introduce Peter Hughes, the Bighorn Executive Chef who is putting Revelstoke on the culinary map. We’ll be posting regular notes from the Chef’s Table at Bighorn, proving that ski fare can be innovative and delicious as well as satisfying after a day skiing the powder. 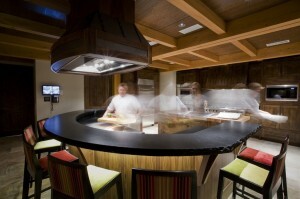 Focussing on local provenance and exciting flavor combinations, Bighorn cuisine is executed with flair and finesse. We say that is the best possible way to start the day. No boring cornflakes and congealed eggs in sight. Unless that’s what you like of course, because remember Peter is on hand to cater for any (weird) whims! Next week, we find out how Bighorn guests will be wooed, via their tastebuds, on Valentines Day.